(This story was published in the Dec. 3, 2003 issue of the Idaho Mountain Express. 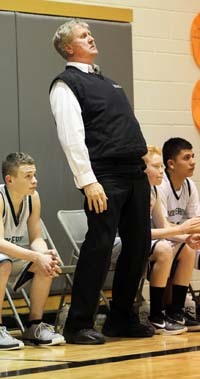 It marked his return to the Wood River High School boys' basketball head coaching job. In his return stint, Trenkle coached the Wolverines to a 11-14 record and the program's first visit to the state basketball tournament in 13 years—and only the eighth in school history. On the screen saver of his computer at Wood River Middle School, Trenkle still has a photo of himself barking some sideline instructions to two members of that team, Brady Femling and Matt Pruett). It's a Yogism, but if you want to talk basketball with Fred Trenkle, you end up doing a lot of listening. Basketball coaches are verbal like that. There's a lot of down time between games, and you've got to work on the persuasive routine that's often necessary to sway subjective referees. So Trenkle talks and talks some more, while waiting impatiently for somebody, anybody, to make a shot during the pickup game on the floor. He sprinkles the conversation with references to his great players. Wesley Moore. Bill Aldinger. Joey Johnson. Playing huge like it was yesterday. It has the trademark small-town Trenkle ingredients—an underdog team battling long odds and a reference to the outdoors. Basketball, the outdoors and his wife Juanita are Trenkle's true loves. His work ethic lets him enjoy them all. In his second year coaching basketball at Wood River High School, Trenkle guided the 1973-74 Wolverines all the way to the State A-2 championship game—still Wood River's only title game appearance. He had players like Moore, Aldinger, Steve Thompson, Tim Martin, Gregg Sturtevant and Scott Uhrig, the uncle of one of Trenkle's current players, Morgan Uhrig. They won with defense. Once, Trenkle said it was the best defensive team he'd ever had. "It was 1974, and Twin Falls was going to state, too," Trenkle recalls, nearly 30 years later in a basketball lifetime that is filled with memories of gyms, big and small. "They had huge articles about the Twin Falls team in the newspaper, and one little-bitty article about Wood River going to state with its strong defense. You know, there was one of the greatest lines I've ever seen in that little-bitty article. "It said, Wood River's defense is like being devoured by a moth." "You know we've got a lot of moths down in Shoshone this year," he says, suggesting that an infestation from his hometown might spread north now that Trenkle has returned to his roots as Hailey's coach. Can suffocating defense be far behind? For the record, a highly-favored Grangeville team withstood Wood River's swarming moth-like pressure defense to win the 1974 state title game 59-52 at Boise's Capital High. But Grangeville knew it had been in a battle. Trenkle's teams don't always win, but they rarely lose if they use discipline, get after people and show respect on and off the court. "You do the best you can with what you have," says Trenkle. "Sports and life are so alike, it's unbelievable. Almost without exception, the hard workers were successful later in life." Roots are important to Trenkle, who coached Wood River cage teams to a 100-58 record in a seven-year Hailey stint ending in 1980. He never had a team as successful as the 1974 squad, but they always played hard. Trenkle, 54, started his 30-year coaching career in the old Wood River junior high school gym back in 1970. Several years after he left Wood River to start his college coaching career, Trenkle returned to the Hailey junior high school and gave a banquet talk to the impressionable youngsters. He sent four Wooden-like messages that should be pinned on the locker of every Wood River student. Remember your roots, he said. Work on improving communication within your family. Set goals and figure out how to accomplish them. And make a commitment to excellence. When Trenkle endured his life's greatest disappointment—the nightmarish finale of his Division 1 coaching stint at San Diego State University from 1994-99—he eventually returned to Wood River Middle School. Never afraid of work, he took a part-time job and methodically worked his way into a full-time teaching and counseling job. When the Wood River coaching job opened last summer, Trenkle said he was interested. Only the cogs of bureaucracy prevented Wood River High School officials from hiring Trenkle on the spot. They made it official Aug. 26. So, for newcomers, who is Fred Trenkle? A hint—although he's a bit more world weary these days, Trenkle still enters a gym for practice with the wide-eyed enthusiasm of a kid dribbling a stolen ball on a fast break. He's a teacher of young men whose own father died when he was six. Trenkle was raised in small-town Shoshone. His mother encouraged hard work. Playing basketball, hunting and fishing were his releases as a boy. He grew fast. As a freshman in high school, Trenkle was 5-2 and 130 pounds. As a junior, he was 6-3 and 185. As a senior, his Shoshone basketball team won its conference. Trenkle ventured 20 miles south and was a member of the College of Southern Idaho's first basketball team that went 33-4 for coach Eddie Sutton in 1967. He attended Idaho State University in Pocatello on a basketball scholarship and earned a degree in history and physical education. His first coaching job was at Wood River, but Trenkle was ambitious. After Wood River's second-place finish at state basketball in 1974, Trenkle took a one-year leave of absence and worked as a graduate assistant for coach Murray Satterfield at the College of Idaho in Caldwell. He started developing his considerable talent for game analysis and scouting while on sabbatical. Trenkle was a scout for CSI coach Boyd Grant's 34-1 national championship team of 1976—CSI's first title squad. On two occasions in the late 1970s, Indiana University coach Bobby Knight promised Trenkle a one-year assistant stipend at the four-year school. Twice Knight reneged. Trenkle, who played a lot of Rec League basketball at the tiny Ketchum gym back then, left Wood River in 1980 and took a three-year assistant coaching job under his former coach Sutton at the University of Arkansas. He and Juanita and their growing family of four hardly made enough money to live on. When he returned to Idaho, Trenkle made extra money by hunting coyotes and cashing in on prices of $50 to $80 per coyote pelt. Trenkle wasn't jobless for long. Returning to his roots, he became the most successful coach in CSI history, with a remarkable 329-36 record in 10 Golden Eagle seasons from 1984-93. The Twin Falls program hasn't been the same since he left. Trenkle insisted on victory and had players who delivered. He had eight 30-win seasons and a record 137-game home win streak ending in 1992. He won eight regional championships and one national NJCAA title, in 1987, when his 37-1 CSI team led by 6-4 Joey Johnson (19.5 ppg) beat Midland, Texas 69-68. He graduated his players. Trenkle, his sights set on a Division 1 college coaching job, resigned at CSI in 1993 after completing a 36-2 campaign. His three sons, Swede, Eddie and Brady, successfully followed Trenkle's large footsteps on the basketball court. In 1994, in fact, Brady Trenkle was a senior when Twin Falls High School—aiming for its first state title in 20 years—dropped a heartbreaking 57-54 overtime state championship game to defending champ Borah (24-2). Fred Trenkle did a lot of the scouting and preparation work for that Twin Falls state runner-up team and was proud that Brady made second-team All-State as a 6-1 guard. Nothing has come easy for the Trenkles, though. While the Twin Falls basketball team was succeeding on the court, Trenkle was having less success latching onto a college job. It became discouraging. Finally, on the suggestion of a friend, Ketchum pharmacist Don Leonard, Trenkle sent his application to San Diego State. In May 1994, he signed a multi-year contract for $72,000 a year. With their children through school, Fred and Juanita took the big Division 1 coaching step and went off to San Diego State in 1994 for what became a bittersweet five-year stint. There were some high moments, but the low points were more frequent for a coach who during his San Diego State tenure was inducted into the National Junior College Athletic Hall of Fame for his CSI work. The competition was fierce in the Western Athletic Coinference, and Trenkle's operating budget was small. He found out that his contract wasn't being renewed on television. He was asked to resign during the 1998-99 season, when the Aztecs were 2-20—after a 48-point loss at Utah. "I found out loyalty doesn't run two ways," Trenkle was quoted as saying at the time. For the first time in his life, he hadn't won. His Aztecs had only one winning season, 15-14 in 1996. His coaching record was 53-81 when he resigned. CSI helped its coaching legend Trenkle mend his wounds by choosing him as a member of its inaugural CSI Hall of Fame in 1999. Then the junior college turned around two years later and shot down Trenkle, a finalist for the open CSI job, in favor of a younger man. Trenkle swallowed his pride and took substitute teaching jobs in Kimberly and Twin Falls. He continued to work during the summers hauling fuel for helicopters. He and Juanita kept their cabin north of Ketchum. He acknowledges he won't be coaching at Wood River forever, but he's grateful for the opportunity to get back into the game with an excellent coaching staff this winter. Trenkle says, "The coaching staff is one of the better ones I've had. Jim (Boatwright) and I have similar philosophies, and John (Radford) will do a good job with the juniors. "The future? I'll try to help solidify Wood River and hopefully get some of the attitudes right. Then someone else can take over," he said, not completely ruling out a return to the junior college or college coaching game. "Work ethic is a big thing. I wonder how many of the kids have had to work hard before they get to the basketball court. In fact, I've had a lot of great teams that haven't known how to work hard. But we'll work hard. I want them getting after somebody." Trenkle's teams have always done the dirty work first and scored later. He says, "I'd like to think that we're not going to have a lot of long nights. I'd like to think we're not going to quit. Hopefully we can play close to the bone and get to where we can make our free throws. "Somewhere you've got to make a stand." As always Fred Trenkle is talking about basketball, but he's also talking about life. "Play basketball!" he yells to his players when they were doing things too mechanically during a drill last week. "This is basketball, it isn't TV. Let's get some flow to this!" After storming around a bit and substituting himself into the action, for proper effect, he reluctantly comes back and sits briefly on a bench. "You always want to be the underdog. We're going to get better and better. "We might have 10 wins. "But I can tell you one thing—we're going to be well coached!"